Two songs left on my list of 100 cover versions. From the very beginning there was always going to be a Madonna song and while she has covered many songs over the years my most favourite cover version by Madonna is her very first. 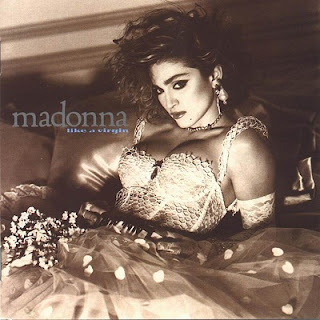 It's Love Don't Live Here Anymore which featured on her Like A Virgin album. It was written by Miles Gregory and was originally recorded by Rose Royce in 1978. In 1985 I was 15 when I bought the Like A Virgin album when it was re-issued with Into The Groove included. That same album is on my desk as I type. Like a Virgin contains three other of my all time favourite Madonna songs; Shoo-Bee-Doo, Dress you Up and Angel. I know I must have been familiar with the original version of Love Don't Live here Anymore. I grew up with a radio station in our back garden so that was definitely a late night radio song. For me in 1985 Madonna was and still is the perfect pop star and all her songs were pure wonderful pop. There were no ballads on her debut album so Love Don't Live Here Anymore was the first time I heard her sing one and of course Shoo-Bee-Doo which was more pop ballad. Love Don't Live Here Anymore was produced by Nile Rodgers who also played both electric and acoustic guitars and his great fellow producer and Chic band member Bernard Edwards played bass. The production mixed guitars, synthesizers, drums and strings and I think that's what created a great track on the album. Lyrically it is a wonderful song; the line 'Through the windmills of my eyes, everyone can see the loneliness inside of me' is just powerful. There is that lovely dizzying sound in Nile Rodger's production. I love how Madonna's vocal builds at the end and then almost breaks down. It was all brilliantly dramatic. I think it's obvious that it was a song that she liked herself when she recorded it. The story of how the song came to be on the album is here. Love Don't Live Here Anymore was released as a single in 1996 when she released her Something To Remember ballads album and was a remixed version with it's own video but the version that I love the most is her original version.